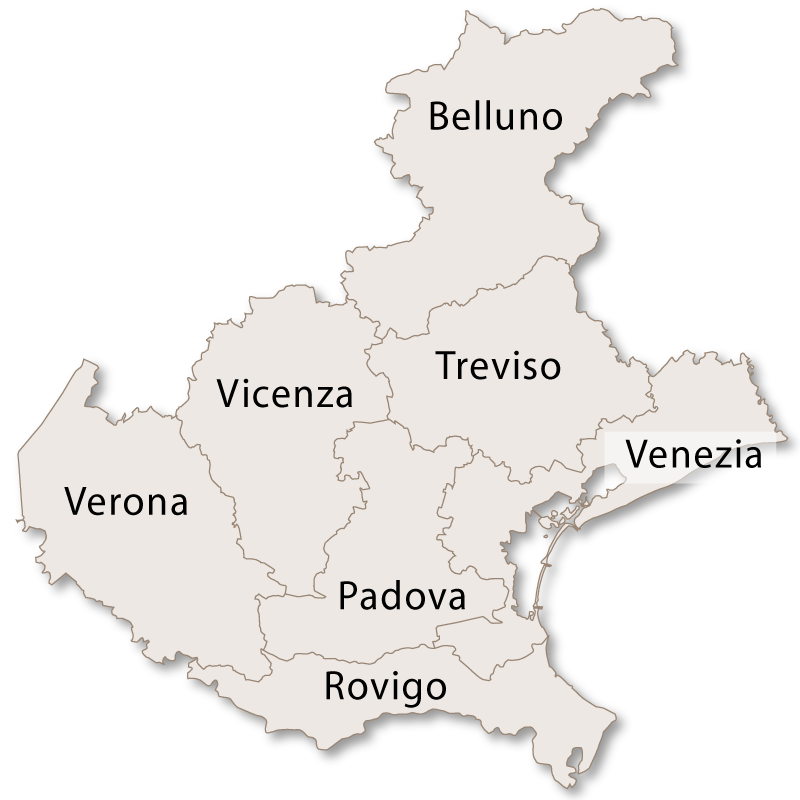 Venice is a major seaport and capital city of the region of Veneto in north eastern Italy. 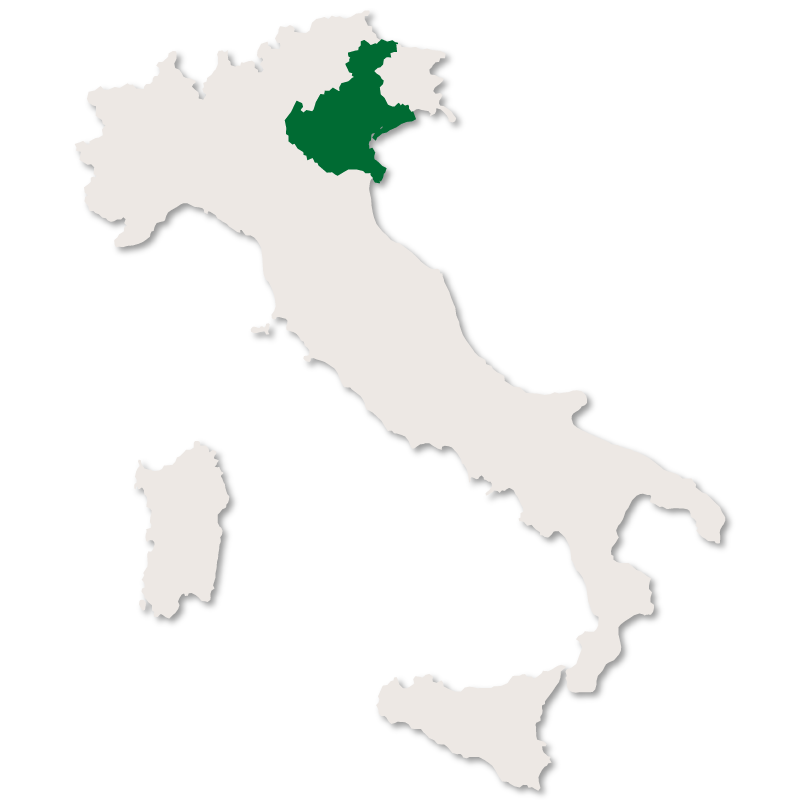 It is located in the crescent shaped Venetian Lagoon which stretches for just over 50km between the land just south of Chioggia and the reclaimed marshes of Jesolo at its northern end. The lagoon is marshy and shallow but is protected by a series of sandbanks with only three openings allowing for the passage of the tides and maritime traffic. The city of Venice actually consists of 118 small, flat islands which are joined together by a network of canals and bridges. The buildings of the city all have foundations which are supported by closely connected wooden piles which sink deep into the compressed clay far beneath the soft sand and mud of the lagoon. Wood was used because once it is submerged and has a shortage of oxygen it does not decay as it does on land but instead becomes harder and stronger. It is believed that many of the piles were made from alder trees which were taken from the area that is now Slovenia, Croatia and Montenegro. The history of Venice dates back over 1500 years when a wave of people from nearby inland and coastal areas, which were under invasion, fled to its impregnable shores. It is believed that the swampy islands already had a few inhabitants who were known as 'lagoon dwellers' and survived by fishing and farming. The new settlers built pile dwellings, set up large fisheries and gradually the people of the islands gained strength and power until Venice became one of the wealthiest cities in history. 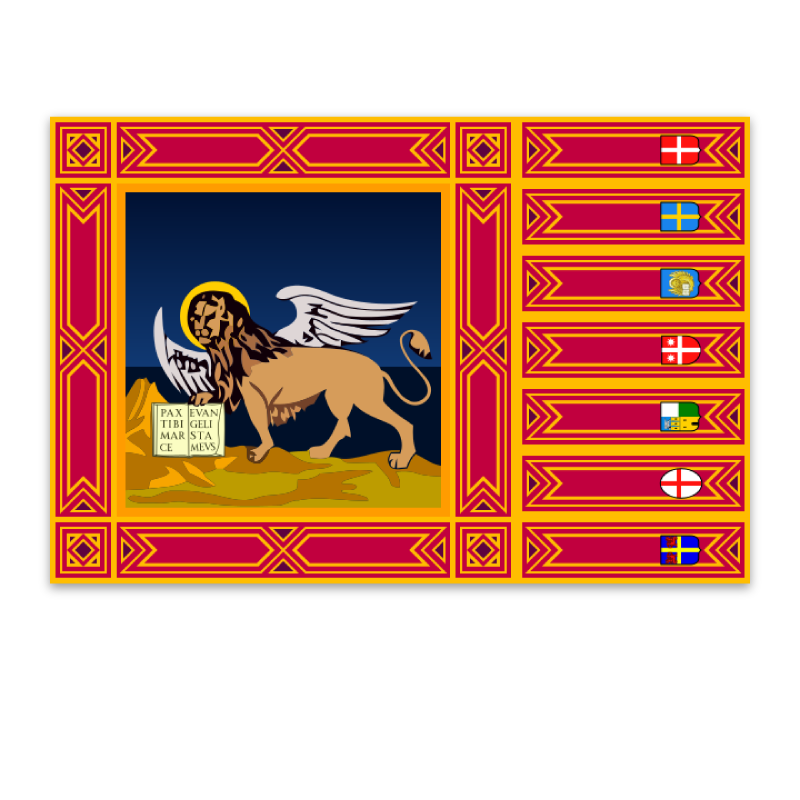 During the middle ages it gained supreme maritime power and from the 13th to the 17th Century it was an important centre of commerce and trade, dealing mainly in silk, grain and spices. Venice has since become one of the most important tourist destinations in the world and the city has approximately 50,000 tourists a day. 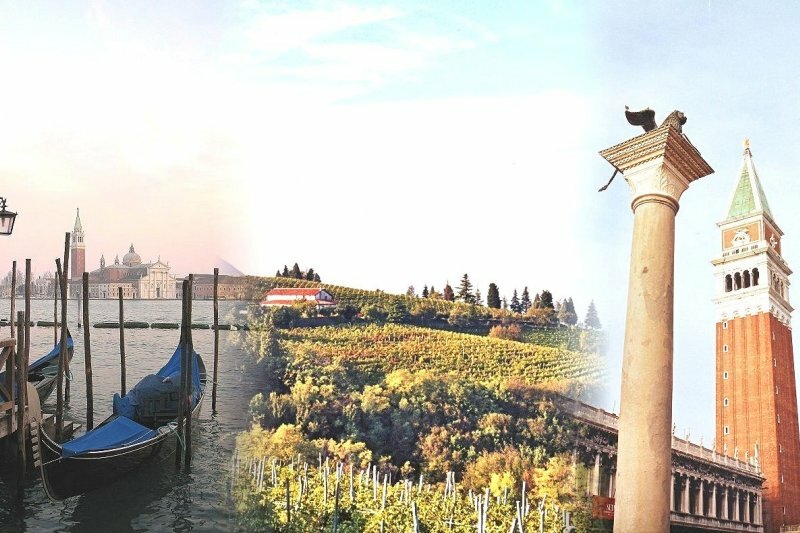 Tourism has been a major sector of Venetian industry since the 18th century, when it was an important destination on 'The Grand Tour', due to its beautiful cityscape, uniqueness and rich musical and artistic cultural heritage. It is now listed as a world heritage site, along with its lagoon and is renowned for its beauty, architecture and artwork. Venice is an incredible city to visit and at first might seem a little daunting with magnificent buildings everywhere, endless crowds of people, water, bridges and a ceaseless canvas of constantly moving colour. It is, in fact, a small, compact city which with the aid of a good map and a comfortable pair of shoes you can get to know very quickly. The historical centre of the city of Venice is split into six sections known as 'sestiere' with each being quite different from the others. 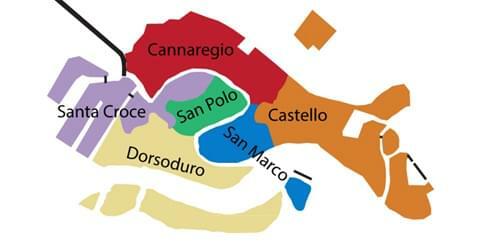 The sestiere are, in alphabetical order: Cannaregio, Castello , Dorsoduro, San Marco, San Polo and Santa Croce. There are many comfortable hotels dotted all over the city. 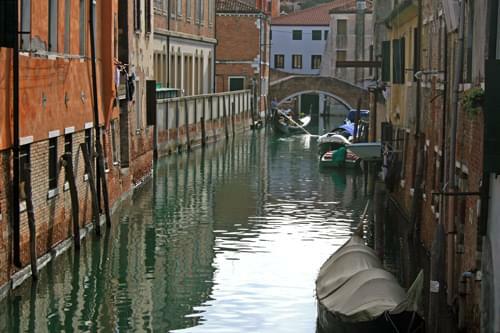 Cannaregio is a quieter, residential area, has the main train station of Santa Lucia and is home to the Jewish Ghetto. Castello, the largest of the sestieri, is one of the most authentic areas of Venice and was formed around the naval dockyard. Dorsoduro, a popular student area, is off the beaten tourist track so is quiet and pretty during the day and has a lively night life. San Marco is the main tourist area with Piazza San Marco at its centre and has most of the famous attractions within its boundaries. 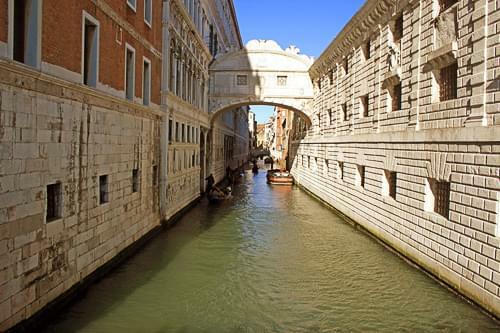 San Polo, the smallest and oldest of the sestiere, is home to the Rialto Bridge and the famous Rialto market. Santa Croce is home to the public transport hub of Piazzale Roma and is the least touristy, and consequently one of the cheaper areas of Venice. One of the best ways to absorb Venice is to walk the narrow streets, endless sets of steps and bridges and soak up the vibrant atmosphere before embarking on the art, history, architecture and culture. 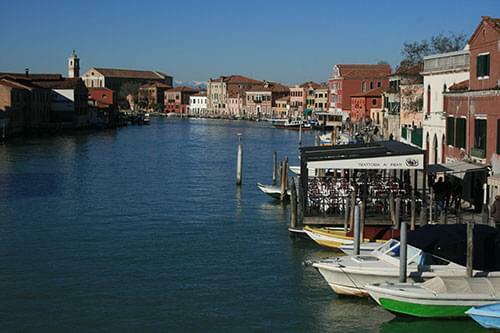 Alternatively, or as well as walking, you can view Venice from the water. A trip in a gondola is expensive but a must if you are only visiting Venice once. 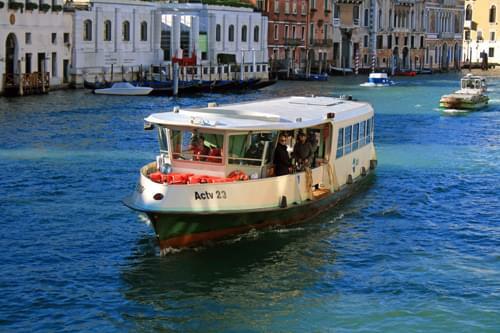 A cheaper alternative is the vaporetto (ferry) for which you can buy a ticket for a few hours, a day or even a week and then get on and off whenever and wherever you like. 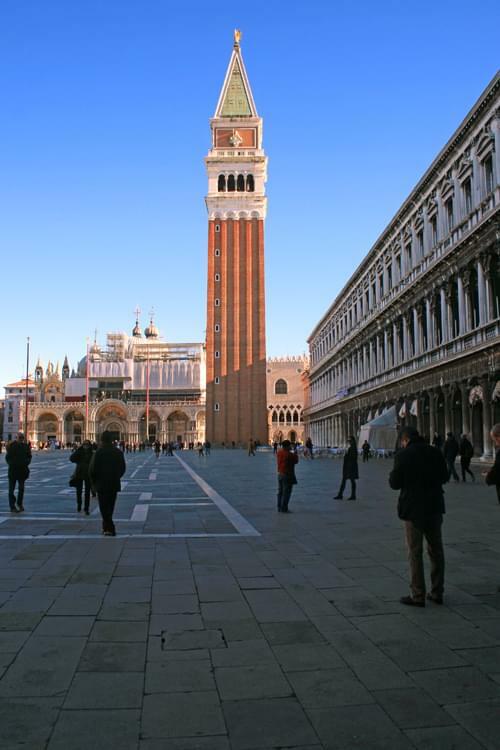 There are an endless number of attractions in Venice, the major ones being in Piazza San Marco such the Basilica, Doge's Palace, Torre dell'Orologio and the Campanile. It is possible to climb the Campanile, which, at 99 metres is the tallest building in the city, and from where you can have a bird's eye view of Venice, the lagoon and, on a clear day, the impressive Dolomites. 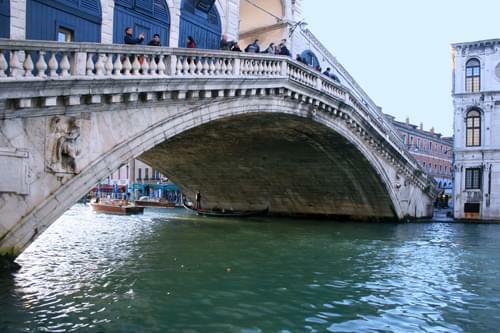 Rialto Bridge and its famous market are also high on the list of attractions together with the Bridge of Sighs, the Grand Canal itself and the numerous churches. The Lido di Venezia is also a popular international luxury destination, attracting thousands of actors, critics and other celebrities to the Venice Film Festival. The Venice Carnival is also a favourite tourist attraction. 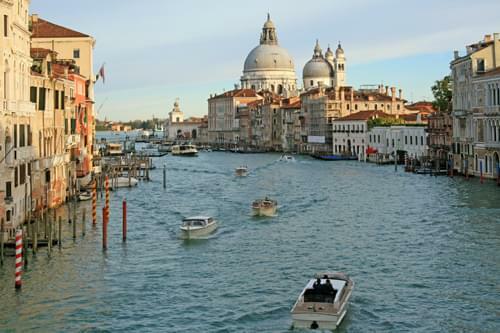 In spite of its popularity, millions of tourists and commercialism, Venice remains one of the safest cities in Italy. 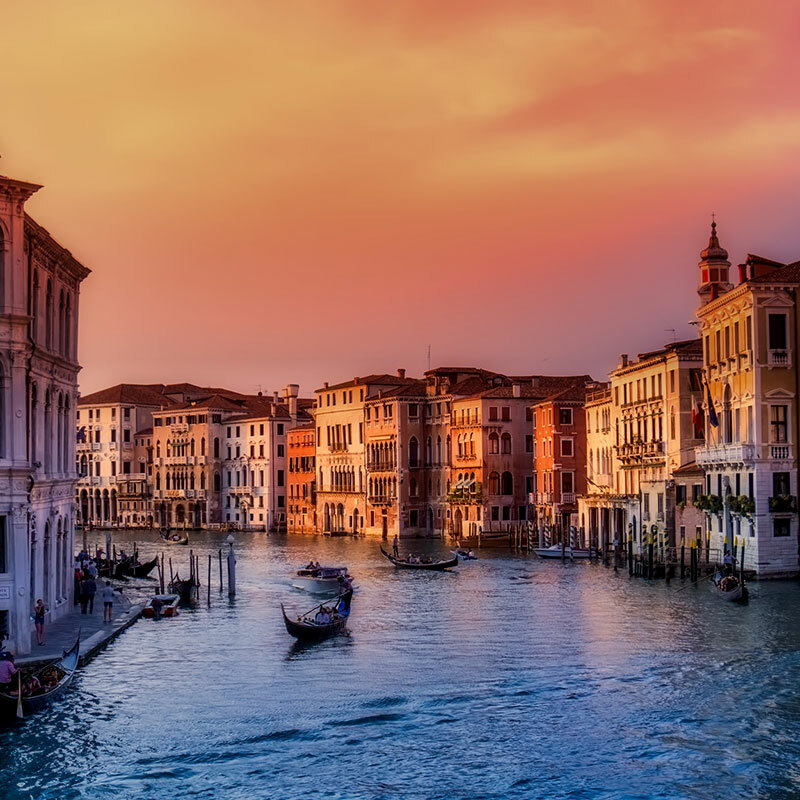 For art and culture there is nowhere better than Venice with the main places to visit being the Gallerie dell'Accademia, The Peggy Guggenheim Collection, Palazzo Grassi , Puntana della Dogana and Museo Correr. For those interested in maritime history, for which Venice is famous, the Museo Storico Navale (Naval Museum) is extremely interesting and, as a footnote, very cheap. There is no doubt that Venice is gradually sinking (by one to two millimetres per year), and not only sinking but gradually tilting slightly eastwards. This is because during the winter months Venice suffers from 'Acqua Alta' (high water) due to a combination of higher tides, a periodic movement of water which affects the Adriatic coast and a strong south easterly wind pushing the sea upwards towards the lagoon. 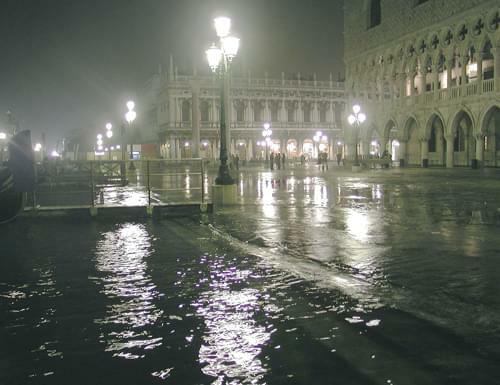 When Acqua Alta occurs there is between 1.5 to 1.8m of water on the lowest lying streets and as Piazza San Marco is the lowest point in the city it is always affected first. 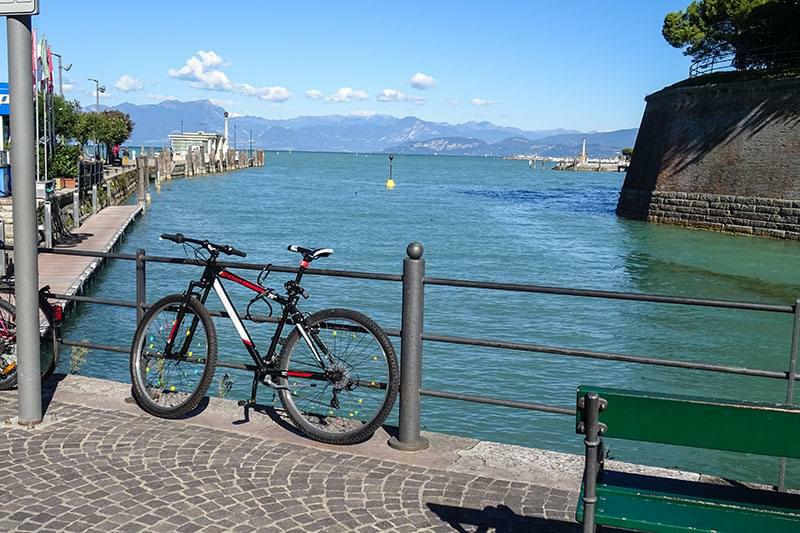 A project is in place to protect the city against flooding and consists of a system containing rows of mobile gates that will have the ability to isolate the Venetian Lagoon from the Adriatic Sea during high tides. The system is being installed at all three of the lagoon's inlets at the Lido, Malamocco and Chioggia. The project began in 2003 and was due to be finished by 2013; however, it is now currently due to be operational in 2017.